After acquiring another CORREA EURO2000 milling machine on the second hand market, Nicolás Correa Service, S.A. performed the mechanical retrofit work and then subsequently sold it on to a Spanish company dedicated to the manufacture of ceramic moulds and which had previously purchased a similar machine, also retrofitted by NC Service. 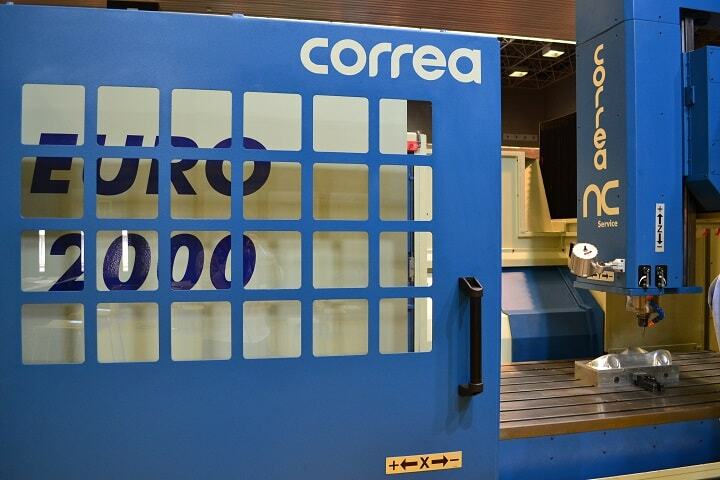 This CORREA EURO2000, gantry type milling machine was the first high-speed vertical machining model to be designed by NICOLAS CORREA, using the finite element method in its structural design. This milling machine is noted for its integrated high-speed motor-spindle which can reach 10,000 RPM, offering high performance as well as great precision. The machine has a travel of 2,000 mm on the X axis, 1,250 mm on the Y axis, and 650 mm on the Z axis. It is also fitted with a 24-pocket automatic tool changer, a chip conveyor, high pressure coolant through the spindle, and an electronic hand wheel for its Heidenhain TNC-426 control. Following the mechanical retrofit process carried out by the NC Service technicians, this CORREA EURO2000 was finally sold to the same Burgos-based ceramic tile manufacturer that purchased a similar retrofitted milling machine in 2014. This customer will yet again dedicate this EURO2000 milling machine to making moulds for the manufacture of tiles. The high speed of both milling machines (10,000 RPM) will allow this customer to considerably reduce mould machining times, whilst increasing production and offering greater precision and a high quality finish. This recent purchase of the same CNC milling machine model gives a clear idea of the extent to which this customer places its trust in the reliability of the CORREA brand, as well as in the professionalism of the retrofitting work carried out by Nicolás Correa Service. The company´s goal? To be increasingly more competitive and efficient in its market.